The founder of the world’s largest gold mining company passed away a couple of days ago at the age of 90. Peter Munk came from humble beginnings. He fled his home country of Hungry during WWII when it was invaded by Nazi Germany. Soon after he boarded a boat from England and came to Canada when he was 20 years old. With no skills, money, or influence Peter and his family had to start from nothing in a foreign country. But that didn’t stop him from wanting to achieve great success. After graduating from the University of Toronto in 1952 Peter thrived in the business world. He helped to build multiple companies, including resorts, an electronic manufacturer, and mining companies. His biggest career move began in 1981 when he formed Barrick Investments, which would eventually become Barrick Gold (stock symbol ABX) the largest gold miner in the world. The company currently produces about 5 million ounces of gold per year across its many operations around the world. Among other things, the billionaire entrepreneur is also known for being one of canada’s most significant philanthropists giving hundreds of millions of dollars to charity such as hospitals. He also established the Munk School of Global Affairs, the Munk Debates, amd was named a Companion of the Order of Canada, the country’s highest civilian honor. Being independently wealthy is nice and all. But doing something meaningful with that money is more important. Having money doesn’t make our problems go away. It merely replaces one problem with another. For example Elvis Presley’s daughter inherited $100 million from her father’s estate in 1993. But that’s when the problems began. Through years of spending and mismanagement the funds have nearly dried out. This year only $14,000 remains of the initial $100 million fortune. Ouch. 🙁 Having a lot of money also created many problems for Jeane Napoles and her family. Peter Munk has 5 children and 13 grandchildren. I hope they can make their inheritance last longer. Financial management education is important for everyone, but especially so for children who come from wealthy families. A survey done a few years ago found that 34% of people rely on winning the lottery as a legitimate retirement plan. 😐 #smh. I’m no financial expert, but when it comes to aggressively planning for one’s retirement, playing the lottery more frequently probably isn’t the best strategy. But it appears her lucky situation had unintentional consequences. At 21 years old today, Jane explains that winning the lottery has actually made her sick. That is to say, “sick of shopping for designer goodies.” She is also “struggling to find a genuine boyfriend who isn’t after her money.” Jane says that despite her wealth people don’t seem to understand her stress of being a millionaire. She says despite her material possessions her life feels “empty and without purpose.” Damn. Poor girl. 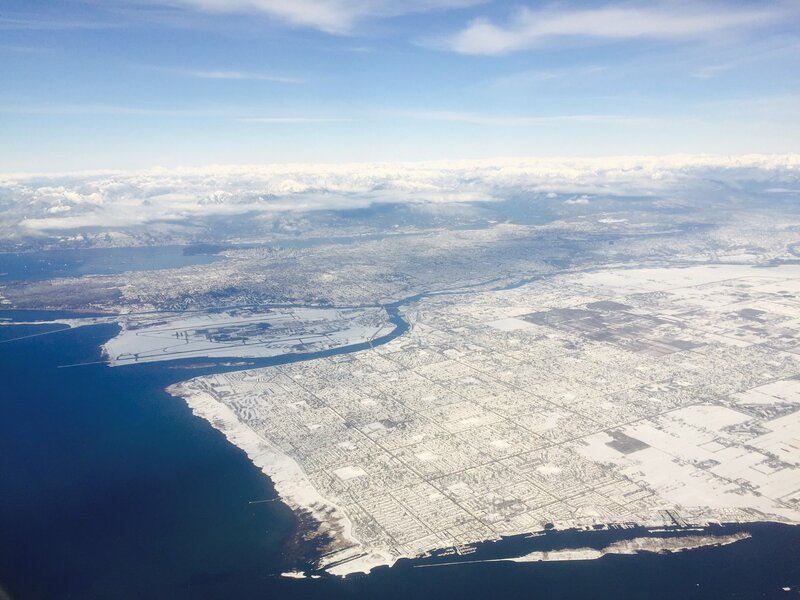 This is what Vancouver looked like a week ago. I recently watched an HBO documentary called “Becoming Warren Buffett,” which features the life of the man himself. The show gives viewers an extensive look at Buffett’s achievements, struggles, and challenges with his career, and probably more importantly, with his personal relationships. The documentary covers his family background and personal relationships. It felt like I was watching an honest biography about Warren. For the first time ever I got an inside look at the day to day events and lifestyle choices of Warren Buffett. It has been a real eye opener! For example on his way to work in the morning, he often stops by a McDonald’s and orders a Sausage McMuffin. Live close to work. It takes Warren only 5 minutes to drive to his office everyday. And he’s been taking the same route for 54 years! Not wasting much time on commuting is why he gets so much done. Be smart. Warren admits that he’s wired in a way that gives him an advantage over others when it comes to understanding businesses. He was always good with numbers starting at a young age and learning about the financial markets comes easily to him. Unfortunately for some, intelligence is largely genetic. Read a lot. Every day Warren goes to work and reads books, newspapers, financial reports, or various other material for 5 to 6 hours. Develop your own inner scorecard. Don’t let other people’s standards and expectations define who you are or what makes you succeed or fail. Learn from people you trust. Business partner Charlie Munger helped Warren realize that in order to build immense fortune, it’s better to look for great businesses at reasonable prices rather than okay businesses at cheap prices. Develop focus. Warren believes this is the most important quality to have if you want to be successful. Charity group Oxfam recently reported that the world’s 8 richest people have as much combined wealth as the poorest 50% of the world’s population. The level of extreme wealth has become more concentrated over time. In the previous year, it took the net worth of 62 individuals to match the poorest 50% in the world. Here’s a look at the trend over time. The middle class is feeling squeezed in many parts of the world. From 2000 to 2014 the number of households in the U.S. considered to be middle class fell significantly. A study from Pew Research shows that a majority of Americans no longer lives in the middle class. Median income of U.S. households in 2014 was 8% less than in 1999, according to Pew. For context, a 3 people household making $42,000 would be considered middle class. One similarity shared by most multi-billionaires today is a focus on philanthropy. 🙂 Bill Gates would already be worth 12 figures today if he hadn’t given so much to charity already. He has been estimated to save over 6 million lives with his efforts to eradicate Malaria, end Polio, and help third-world countries grow rice. Warren Buffett wants to donate 99% of his wealth to charitable causes. Hundreds of other billionaires have signed up for the Giving Pledge, a campaign to encourage the rich to give away most of their money. I still have to decide how I want to spend the remaining $999,999.75 though. 😄 j/k. If you’re in the market for the best property money can buy then look no further than Vancouver, B.C. Earlier this year the exclusive downtown penthouse in Coal Harbour went on the market for CDN $58,888,000, which makes it the priciest Canadian home to be listed on the MLS. Located on the 89th and 90th floors, this 11,000 square feet apartment comes with a steam room, a library, a movie theatre, and 6 bedrooms including a rather large 550 square feet master suite. Not surprisingly, this sky high apartment also comes with sky high expenses. The estimated maintenance cost is around $18,000 per month, which actually isn’t bad considering the apartment’s value, eh?